Normally I would have written this up immediately following the last Unwound box set as this was a bonus add on you could order when purchasing the set directly from Numero Group. It's out of order because on Friday I wrote up the new Custody 7" on PopKid (Still for sale, go buy!) and yesterday I just forgot. Today I remembered, so here it goes. Considering this was the add on for the last box set, Empire, this could have ended up being Peel Sessions for only the later songs in the career of the band. Lucky (for me anyway since I don't really like the last two albums all that much), there is a bit of variety on this album. Well at least as much variety as you can get when there's only 3 songs played. It starts off with a pretty cool version of "Hexenszene" from New Plastic Ideas. The bass is a little low, but the guitar antics are right up front and sound great. There's a nice little noisy freak out at the end and it's a good version of the song. Next up is "Side Effects Of Being Tired." It's probably one of the best, if not the best song from Challenge For A Civilized Society. A little faster and noisier than the vast majority of that album. Last up is "Kantina/Were, are and Was or Is." The original version of "Kantina" was from Fake Train and even back then clocked in at a hefty four plus minutes. This Peel Session version is creeping up on fifteen minutes long with a long instrumental section/jam tacked on to the end. It's an interesting listen, but I prefer the album version. 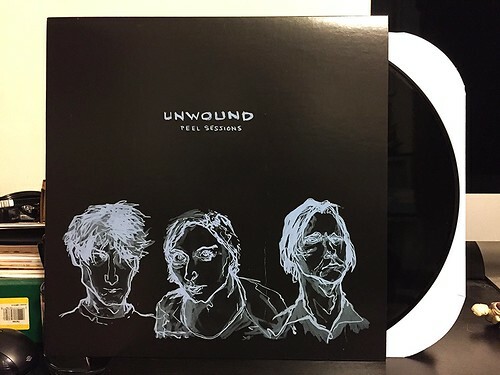 This may very well mark the last time I write about Unwound on this site. I've done all four box sets, I've done all four bonus LPs and I even did all of their individual 7"s as I picked those up a couple of years ago. I suppose there is always the chance I may grab the original pressing of their LPs, but I'm thinking that's somewhat unlikely. Still, a great band for the most part. I just hope we get another Survival Knife record soon.